Produced to perfection, the spring 2016 Jonathan Adler sun collection carries a statement piece for every glamour girl. For the woman who wants to be admired for her style, the St. Tropez and Buenos Aires offers jaw-dropping elements with its oversized and modified cat-eye silhouettes respectively, in addition to a striking gold leaf pattern throughout. Classically beautiful, the Malibu is crafted from rich acetate and features a luxurious malachite design and oversized round shape, catering to the woman who loves simple, yet elegant styling. Women who gravitate towards retro panache will be intrigued with the Havana – a timelessly chic frame with a modified square eye silhouette. Guaranteed to please, this collection has the Midas touch. This Jonathan Adler sun collection is available for purchasing now. For more information or to schedule a viewing with your REM sales representative, call 800-423-3023 or visit REMEyewear.com. Just like its namesake, Havana, the colorful capital of Cuba known for the Spanish colonial architecture of the 16th century, the Jonathan Adler Havana sunglass frame suggests nothing less of subtly rich elements. Boasting a modified square silhouette, the acetate Havana frame also has custom acetate Jonathan Adler pattern on the inside of the temples and signature ‘JA’ initials on laser-engraved epoxy filled round temple tips, creating an infectiously freeing Caribbean aura for its wearer. Available in Black, Brown and Tokyo Tortoise in 51/21/145. The St. Tropez sunglass frame is just as breathtaking as the beaches and romantic scenery in St. Tropez along the French Riviera. Chic and full of life, the St. Tropez is crafted from rich acetate and boasts an oversized cat-eye silhouette, a striking gold leaf pattern throughout and a stunning Jonathan Adler logo plaque on the temples. Perfect for the woman who wants to make a statement, the St. Tropez is a head turner that’s sure to reap complements. Available in Black and Cream in 56/18/140. The Buenos Aires sunglass frame is alluring, lively and breeds confidence in its wearer. A combo frame with a modified cat-eye silhouette, the Buenos Aires features a luxurious gold leaf pattern throughout, a signature Jonathan Adler logo plaque on the temples and signature ‘JA’ initials on laser-engraved epoxy filled round temple tips, creating unique eyewear that evokes passion and vibrancy for its wearer. Available in Black and Cream in 56/17/145. Inspired by the affluence of Malibu, California, the Malibu is a pristine sunglass frame that’s glamourous yet functional. Crafted from rich acetate with a malachite design, the Malibu features an oversized round shape and the iconic Jonathan Adler logo plaque on its temples, in addition to a laser-engraved epoxy fill of signature ‘JA’ initials on round temple tips. The Malibu frame will make you feel rich, luxurious and unstoppable. Available in Black, Brown and Bone in 57/20/140. REM Eyewear is a worldwide leader in the innovative design, manufacture and marketing of state-of-the-art eyewear, serving more than 80 nations across six continents, with headquarters in Los Angeles, Hong Kong and the UK. Lead by award-winning Creative Director, Nicolas Roseillier, REM’s portfolio of best-selling brands includes John Varvatos, Jonathan Adler, Converse, Tumi, SPINE, Jones New York, Cosmopolitan, Lucky Brand, Lucky Kid, Indie, Lipstick, Surface, and Visualites. Family owned-and-operated for more than sixty years, REM Eyewear is dedicated to upholding its core values of Quality, Imagination, Commitment, Collaboration, Wisdom, Trust and Respect. 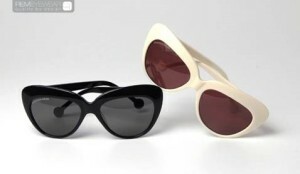 For more information on REM Eyewear, visit us at www.REMEyewear.com. Jonathan Adler is dedicated to bringing style, craft, and joy to your life. There are more than 25 Jonathan Adler stores worldwide, a thriving e-commerce site, and a wholesale business boasting over 1,000 locations globally. His roots as an artist and sculptor continue to influence his brand of home accessories, which includes decorative objects, tabletop collections, bedding, bath accessories, candles, furniture, rugs, pillows, lighting and more. Adler is the author of the Happy Chic book series. He lives in New York City with his partner, Barneys Creative Ambassador at Large Simon Doonan, and their Norwich Terrier Liberace. To learn more, please visit www.jonathanadler.com.